Here is a wonderful report courtesy of Ontario Hemp Alliance President Gordon Scheifele. You can view the report below or download it as a PDF file. You can view my earlier post on The Hemp Report about the field day here. For more information on this event please see Field Day at Ridgetown on the Ontario Hemp Alliance web site. August 16, 2004 — Industry experts, economic development officials, fibre producers, and government officials gathered in Central Eastern Ontario (CEO) for a full day of tours and discussions designed to help participants understand the region's potential for development of a biofibre industry. Known for production of hemp and flax in the 1800s, the CEO Region runs from Brighton to Kingston and north from Lake Ontario, and a half day's drive from any of Toronto, Ottawa, Montreal or upper New York State. The mix of soils and climate, with significant local receptor capacity, suggests the region is ripe for a resurgence of an environmentally-friendly fibre alternative. Just as important, the region already has a nucleus of hemp fibre producers and regionally-adapted genetics. 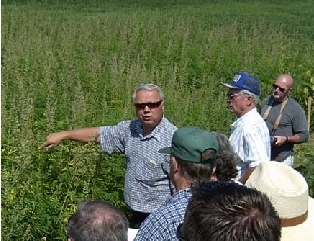 Much of the field day focused on demonstrating existing capabilities through visits to four local farms, several of which are pursuing bioproduct development initiatives based on hemp fibre. John Baker reviews eight test plots of feral hemp variety mother lines and hybrids. The mother lines were collected from four sites in Peterborough, Hastings, and Lennox and Addington Counties. Ontario Hemp Alliance President Gordon Scheifele and local plant breeder-researcher John Baker provided a report on the spring 2004 federal biofibres trade mission to Germany, focusing particularly on technology developments and opportunities. John Baker's participation in this mission was supported by Trenval CFDC, the Quinte Economic Development Commission, and Biotech CEO. Initial presentations also updated participants on the region's participation in Ontario's Biotechnology Cluster Innovation Program (BCIP) and expectations for further advances in the fall of 2004. OHA President Gordon Scheifele — wearing a hemp hat from Lee Valley — examines a feral hemp variety now grown for fibre in Hastings County. 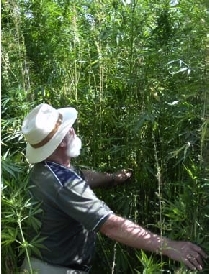 At further field sites, participants learned about regional efforts to rejuvenate stocks of Carmen seed (hemp fibre) for the 2005 growing season as well as preparations for registration of feral varieties recovered by Mr. Baker, who is licensed by the federal government for bio-prospecting. The Carmen plot (left side of photo) will be harvested — using conventional farm equipment — first for seed, then again later for fibre. Note that the hemp is higher than the corn (right side). Participants also viewed samples of hemp fibre-based products under development by local entrepreneurs and participated in a lively discussion over dinner of strategic priorities for development of a regional biofibres industry. Special thanks are extended to the Quinte Economic Development Commission for logistical support as well as to the Harry, Grant, Moorcroft, and Baker families for hosting the Field Day participants at their homes and businesses. Individuals interested in staying in touch with the development of the CEO Region's biofibre industry are invited to get in touch with Kathryn Wood at 613-376-6006 or by email at ncr@sympatico.ca. Hayo van der Werf, Editor of the Journal of Industrial Hemp, has graciously given The Hemp Report permission to reprint the Editorial from the Journal of Industrial Hemp, Vol. 9, #2. I received my copy of the Journal two weeks ago and I was very impressed by the continuing quality of the Journal and the editorial was quite eloquent. You can get the Journal of Industrial Hemp directly from Haworth Press, but we at The Hemp Report encourage people and companies to join this important organization directly and get the Journal as one of the many benefits. It is with great pride that we publish our 18th issue of the JIHA/JIH, that is nine years of journals, spanning 11 years. Our next issue will be issue number 10.1 and the changes from the beginning of the IHA in 1992 and publication of our first journal JIHA Vol 1.1 in June 1994 to today, are amazing. In 1992 the worldwide industrial hemp industry was almost on its last legs, driven to its poor state by a combination of synthetic fiber cordage and textiles as well as drug laws forbidding work with industrial Cannabis, regardless if the variety was nearly devoid of psychoactive compounds. Ten years later, industrial hemp is again emerging as an sustainable way to produce fiber, cordage, textiles, paper pulp, energy yielding bio-mass, hurds, construction composites, seed oil and foods, as well as the thousands of products derived from these basic materials. The IHA is proud of its contributions to the world wide effort to reintroduce industrial hemp into the modern world's economic main stream. The IHA's membership, never more then 250, has seen a decline in recent years. Our immediate focus should be to encourage new membership from anyone interested in the issues that surround industrial hemp. 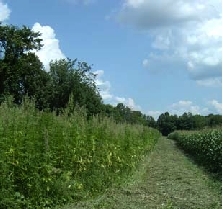 Regardless if new members are scientists, medical professionals, researchers, farmers, business persons, store owners, activists, or students, the IHA needs the strength that comes from a diverse and robust membership, as well as the funding to engage in projects that will further the aims of industrial hemp worldwide. If you can, please suggest to colleagues and libraries that are interested in industrial hemp that they join the IHA. Just send the IHA the email or postal address of anyone interested and then we will send them membership info. The section for peer-reviewed papers opens with a paper by Hillig, which presents a characterisation of the variation in allozyme allele frequencies in a broad sampling of the Vavilov Institute (Russia) Cannabis germplasm collection. These results will be of use in the selection of breeding material and in planning further germplasm collection and maintenance. The article by Chen, Liu and Gratton summarises and reviews the research that has been carried out at the University of Manitoba, Canada, to provide a greater understanding of the physical and mechanical properties of the hemp plant, of the energy and power required for conditioning and cutting it, and of the development of hemp harvesting and processing equipment. The contribution by Hanyun and Shinwari describes hashish production and marketing in the Afridi Tirah semi-autonomous region, one of the most remote parts of Pakistan, close to the Afghanistan border. The section for non peer-reviewed papers starts with the third issue of the Collections Corner, in which Don Wirtshafter pictures and describes his collection of hemp-related hang tags and labels. He further announces his objective of creating a web-site for public use, giving access to a database of hemp products and companies. Readers are strongly encouraged to propose articles in this series for future issues. This issue's Wide Wild World of Hemp column, produced by John Dvorak, our in-house hempologist and internet editor, reflects on "The invisible hemp industry". This article goes into the history of hemp and draws parallels between today and the past. In our series Cannabis Clinic John McPartland and Karl Hillig present Fusarium wilt, a disease caused by two closely related Fusarium fungi that infect Cannabis roots and then move systemically through the plant. This disease reduces fibre quality and yield. This issue features a Hemp Production Note by Cecil Vera and Arthur Hanks. They present the production of hemp as an oilseed crop in western Canada. They discuss, amongst others, fertilisation, weed control and harvesting. Franjo Grotenhermen presents a brief review of the cannabinoid system. He discusses cannabinoid receptors, endocannabinoids and their affinity to the cannabinoid receptor, the tonic activity of the system and therapeutic prospects. The next article, by Michael Karus, presents results from market surveys conducted by the "European Industrial Hemp Association" (EIHA) in 2001, 2002 and 2003 on hemp production, processing and products. In 2003, the area under hemp cultivation in the European Union (EU) reached 18,000 ha. The last item in this issue is a short report by Giuseppe Mandolino and Paolo Ranalli, reporting on the "Hemp: perspectives for advanced utilisation" symposium, held in Bologna (Italy) on March 5 and 6, 2004. "We are grateful the Air Force clarified their policy on hemp personal care products, which include soap, shampoo, lip balm, lotions and sun block, among others" says Candi Penn, Executive Director of HIA. "Although the Air Force policy on hemp foods is similarly ill-founded, the Air Force clarification on skin care will certainly help dispel the myth that someone could fail a drug just from using hemp tanning lotion. We hope news media will report this clarification since earlier reports this year damaged legitimate business, especially hemp sun block manufacturers, just as the summer buying season began." The hemp is getting ready to set seed in Canada and harvest is not too far away! The Canadian Hemp Trade Alliance/ Alliance Commerciale Canadienne du Chanvre (CHTA/ACCC) will be holding its 2004 Conference and Annual General Meeting in Winnipeg, Manitoba on October 24th, 2004 at The Fairmont Hotel. The 2004 CHTA Conference will include speakers on hemp seed food, hemp production, hemp as a nutraceutical, and the latest research, as well as address issues related to fibre processing, economic development and new opportunities. The all day event will begin at 8 AM and will include a hemp lunch, snacks, and excellent networking opportunities for entrepreneurs, farmers, businesses and researchers involved in the Canadian hemp industry. As well, the CHTA's AGM will include elections for Board of Directors and a membership roundtable. This event follows the University of Manitoba's "Role of CLA in Human Health Conference", also to be held at the Fairmont Hotel on October 21-23rd. "The CHTA held its first annual meeting in Toronto last October and we are very pleased to be having this year's event in Winnipeg," says Arthur Hanks, Executive Director CHTA. "Manitoba, in many ways, is Canada's hemp heartland and attendees will be coming from across the country to be here on the 24th." Industrial hemp has been grown commercially in Canada since 1998 and Manitoba leads the country in hemp growing, boasts several vibrant hemp businesses, as well as cradling a dedicated research community. Hemp seed foods are attracting nutritional interest across North America as they are high in digestible protein and are also rich sources of Omega 3 and Omega 6 Essential Fatty Acids. Hemp fibre is increasingly valued as a premium component in such applications as paper, composites, nonwovens, and building materials as well as many other uses. Conference cost will be $50 for CHTA/ACCC members and 75 $ for nonmembers. Table display opportunities will be made available for $50 to CHTA members. Space is limited. Ticket Sales and Pre-registration open Sept 1st, 2004. The CHTA welcomes speaker inquiries. Full speaker lineup will be announced September 1st. The nonprofit CHTA's mandate includes market development and advocacy, information creation and distribution, research. Established in 2003, the CHTA is a national group of hemp processors, marketers, farmers and researchers. Membership is open to all companies active in the Canadian industrial hemp sector. Hemp is our business. For more information about the CHTA/ACCC and hemp in Canada please see our web sites at www.hemptrade.ca and www.infochanvre.ca. The year was 1998, the Canadian government had just announced the end of a 40-year ban on growing industrial hemp, and the industry was fairly frothing at the mouth in anticipation of hemp use expanding from just food and clothing into the automotive, plastics, pulp and paper, biofuel and insulation industries. Canadian farmers planted about 30,000 acres of hemp in 1999, and 13,500 the following year. Now, five years later, the bales from those bumper crops sit in farmers’ barns, idle like the industry itself, which is still primarily driven by the hempseed, not the fibre. In recent years, more conservative acreage has been planted. This year saw 6,750 acres of hemp planted, 90 per cent for seed. Only 200 acres were planted in Ontario. It was with great interest that I read your recent article on Ontario Hemp Alliance's Field Day "Hemp Update July 23, 2004". It was a solid piece that did an accurate job of where the Canadian hemp industry has been and where it might be going. I'd just like to address a few points for your readers' benefit. "Farmers are now only encouraged to grow if they have such a contract." This has been a standard business practise since oversupply scenarios of the early years, when there were very few buyers and extremely underdeveloped consumer markets. 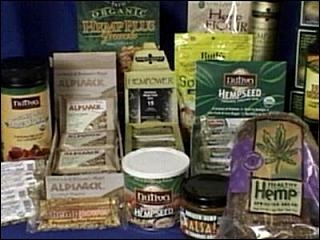 Since 1999-2000 we have seen the establishment of a domestic hemp food industry and a growing consumer base. Hemp does not have a marketing board of course, but any specialty crop can experience wild fluctuations from year to year, as parallel examples of Echinacea and ginseng have taught us all. Now for the past few years, the good news is that hemp farmers have enjoyed strong price stability: certified organic producers have enjoyed an average price of 85 cents a pound (clean) at the farmgate. Because of steadily growing demand, there is currently a shortage of certified organic grain on the market, so it likely this fall's crop will remain a seller's market. Hemp remains an excellent opportunity for some farmers. "Recent U.S. court decisions, musings at the federal and provincial levels of government, and in the automobile and paper industries lead insiders to be optimistic, but cautiously so." As for industrial fibre, it is a very complex issue, but I'd like to mention that research on applications such as paper, biocomposites and building materials are underway in at least 4 provinces. Led by Ontario, the Canadian research community is now conducting more hemp fibre research than at any point in the past. With a growing science and technology base mustering behind them, the single biggest challenge facing potential hemp fibre processors is accessing capital markets, which remain very cautious about investing in the agricultural sector in general. The Canadian Hemp Trade Alliance was formed in 2003: we are a non-profit national group of hemp processors, marketers, farmers and information specialists. I just finished reading the story "The Colonel's Weed" by Stephen Young about the Chicago Tribune's experimental hemp farm. I had previously read the documents in the Shaffer Drug Library about the farm. I am not yet completely convinced that the Anslinger/Du Pont/Hearst hemp conspiracy is real. It's plausible, especially considering what else was going on at the time, but it just does not seem probable. Mr. Young noted something interesting that I never knew before "McCormick controlled even more timberland than Hearst." My personal theory is that, just like DEA now, the Federal Bureau of Narcotics was protecting its budget and searching for ways to increase it. From what I understand the forerunners to the DEA were the Bureau of Internal Revenue (1915-1927), Bureau of Prohibition (1927-1930), Federal Bureau of Narcotics (1930-1968), and Bureau of Narcotics and Dangerous Drugs (1968-1973). Harry J. Anslinger was appointed to the newly created position of Commissioner of the Federal Bureau of Narcotics (FBN) on August 12, 1930 and he served in the position until 1962. He had previously served as Assistant Prohibition Commissioner in the Bureau of Prohibition. So, the Bureau of Prohibition became the Federal Bureau of Narcotics and Anslinger knew that he would need to find a way to keep the FBN from becoming obsolete like the Bureau of Prohibition had. Over 70 years of misinformation. It seems to be working pretty well. For more background information please read Unraveling an American Dilemma: The Demonization of Marihuana - by John C. Lupien. CHICAGO -- During World War II, farmers all over America were urged to grow industrial hemp so that Allied troops would have plenty of rope and canvas. Many Illinois farmers raised the plant, including Paul Taylor's father. The old hemp processing plant still stands near his family's Esmond farm. Taylor said he would like to put the building to good use once again. Video: NBC 5, Chicago, You will need Real Player, 4 minutes 50 seconds. There are lots of things the average American doesn't know about hemp. What they do know is its connection with marijuana, and for that reason, growing hemp is illegal in the United States. Hemp is getting short shrift, and that's too bad, said Julia Fauci, environmental activist and DeKalb County Board member. She said hemp is a strong, valuable plant that saves trees by being used in their place, to make paper. 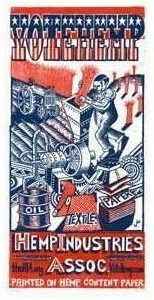 It also strengthens fabric and is much stronger than cotton. In addition, it also can be processed to produce a valuable oil. Proceeds from this auction go to benefit The Hemp Industries Association. Proceeds from this auction go to benefit Vote Hemp. Yesterday I was reading a story at CBS News about Depression: Cure's In Your Diet? In it the author writes that in "Three separate clinical studies in Britain, Israel, and the U.S. show an increased intake of omega-3 fatty acids found in fish had what researchers describe as "a substantial impact" on depression and bi-polar disorder." I've thought for a long time that things like this are caused by a chemical imbalance of some sort and the cure is to correct the imbalance and not to just take pharmaceutical drugs to mask the problem. Diet seems to be a little known thing to doctors and lay people alike. OK, so I have been educating myself, and cooking with hemp seed and oil a lot, too. (I'm just about out of shelled hemp seed so today I ordered another 25 pounds.) One interesting thing is that the Dietary Guidelines for Americans is being updated. I read in one of their meeting summaries that Dr. Edward Siguel testified that he "found that about 30 percent of adult Americans are deficient in omega-6 fats, and about 70 percent are deficient in omega-3 fats, using samples from the Framingham Heart Study and several other populations." That's pretty stunning, especially from the man who coined the term essential fats. So, about 70 percent of Americans don't get enough omega-3s. The answer is not just using menhadens oil in school lunches in South Texas schools. Menhadens oil (a refined marine oil that is derived from menhaden fish) has been going through an update to its GRAS (generally recognized as safe) status in the U.S. The FDA wanted to set "limitations on the maximum use levels of menhaden oil in specific food categories. FDA concluded that these limitations are necessary to ensure that daily intakes of EPA and DHA from menhaden oil do not exceed 3.0 grams per person per day (g/p/d)." A lot of people are finding that they want to get their omega-3 fatty acids from non-marine sources. So how do you find out what you really need? Here is a simple answer: Health Canada recommends a daily intake of omega-3 fatty acids that represents 0.5% of total energy intake. For an adult on a 2000 kcal diet, this is about 1 g of omega-3 fatty acids. (The United States does not have a recommended intake of omega-3 fatty acids at the present time, though the National Institutes of Health recommends 2 grams per day.) Wouldn't it be easier to eat a product that has 4tsp/13g of shelled hemp seed or 1 tsp/5.6 g of hemp oil to get your 1 g of omega-3 fatty acids? I think so. For those of you who want to know more detailed information I have found some obscure government web sites about EFA Education. In it you can find out about essential fats in food oils, though hemp oil is not mentioned, yet. However, the coolest thing is their Stories for Beginners which are two PowerPoint presentations about benefits of balancing omega 3 and omega 6 in the body. This is real eye-opening stuff! The most interesting part is that I learned about eicosanoids for the first time. On the NIH web page about eicosanoids they state that "Eicosanoids are hormone like autacoids (auto=self, akos=healing) formed by body tissues during self-healing responses to stimuli. They are formed from tissue highly unsaturated fatty acids (HUFA) that we acquire only by eating essential fatty acids (EFA) in foods or supplements. The balance of dietary omega-3 and omega-6 EFA affects the balance of tissue HUFA and therefore the balance of omega-3 and omega-6 eicosanoid actions." Technical, but important stuff. What it all comes down to is that we need to balance out intake of omega-3 and omega-6 fatty acids. Diet Balance--> Tissue Balance--> Eicosanoid Balance. So, in the end hemp oil contains the omega-3 and omega-6 EFAs in the nutritionally optimal 1:3 ratio and hemp seed also contains the higher-potency omega derivatives GLA and SDA. Bags, T-shirts and other goods with emblems of hemp have been seized from a privately-owned shop in the far-eastern city of Khabarovsk by the officers of the federal drug fighting agency, Gosnarkokontrol, the main directorate of the agency for the Far-Eastern federal district told Interfax. To see many more news stories like this please see our Hemp News Archives and do a page search for MosNews. We can now add a new word to the dictionary "narcocensor". There is a little bit of hemp in the news today. Over at ESPN Page 2 writer DJ Gallo pokes fun at pot smoking football players in One smokin' team by saying that "They'd wear uniforms made from hemp and refuse to work out or watch film." Grrrr.... It is interesting to know that Canada's Olympic team will be wearing hemp uniforms in 2010. Please see Cover Me with Hemp for more on this. At the LA Times Valerie Reitman writes about the Low-carb lowdown and notes that "At the Institute of Food Technologists trade show in Las Vegas earlier this month, ingredient makers were showcasing substitute ingredients for the now reviled white flour and sugar that included dense proteins made from whey, soy, hemp, flax and oats along with gums, cellulose and other bulking agents." The same story also ran in the South Florida Sun-Sentinel. And finally Mary Butler at The Daily Camera went smoothie shopping and reported in the story Big smoothie that Gina's Juice Joint uses hemp seed in their popular offering, Gina's Groovy Smoothie. T.R. O'day, Gina's Juice Joint owner, is quoted as saying that "It's excellent for getting your omegas," O'day said referring to the essential fats omega 3 and omega 6." We at Hemp Traders are growing by the day and we're passing our good fortune on to our customers. We are just letting everybody know that we got rid of that annoying handling/cutting charge of $7.50! That means you can feel free to order as little sample yardage in any fabric as you want without fear of any handling/cutting charge! Have a hempy day!